Live examples of campaigns that are using Votigo’s technology are a great way to understand how our platform works. They can also help you get ideas and inspiration as you start to plan your next promotion! Today, we’re excited to share two new live sweepstakes examples from Transitions Lenses and Music Today, because they do a great job of representing the different ways you can use Votigo’s sweepstakes solutions to generate leads and engage your audience. When it comes to engaging your audience and involving them in the larger conversation for your brand, UGC (user-generated content) campaigns like Photo Sweepstakes are a great way to go. This week, Transitions Lenses launched a promotion specifically design to give their audience a way to share what the brand means to them. Entrants are invited to share a photo of how changing light shapes their days for a chance to win weekly, random-draw prizes. 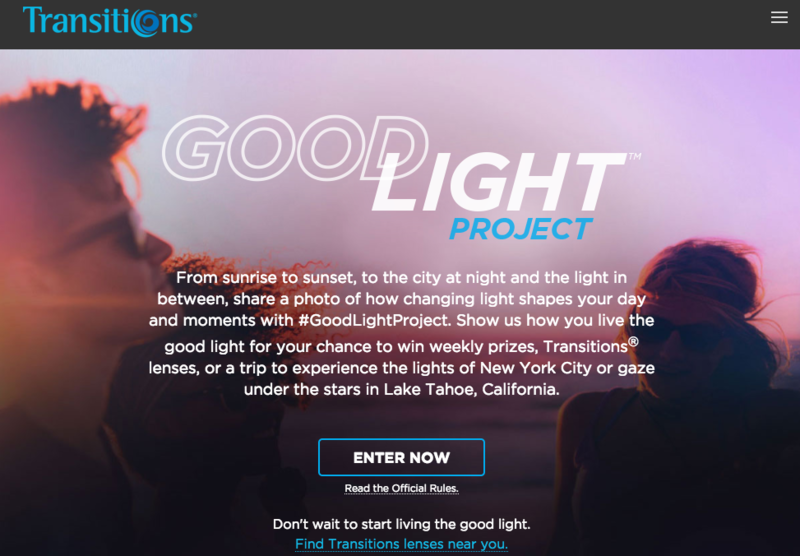 Participants can enter via Direct Upload on Desktop, Smartphone or Tablet – – or with the campaign hashtag #GoodLightProject on Twitter or Instagram. Allowing users to choose their preferred entry method ensures that anyone can enter, maximizing the reach of the promotion. This sweepstakes was built by Votigo’s talented full-service development team and features custom HTML emails, social sharing and mobile responsiveness. Music Today’s Twin Peaks 27th Anniversary Sweepstakes Enter-to-Win Sweepstakes are a great way to grow your marketing lists and drive awareness of an event or new product offering. This is because typically, the barrier to entry in a sweepstakes is low – which means the likelihood of getting a lot of entries is high. Add in a compelling prize or a sense of urgency with a fast-approaching entry deadline, and you’ve got the formula for campaign success. In Music Today’s latest sweepstakes, they are driving awareness of TV Series Twin Peaks’ 27th anniversary. All people have to do in order to enter is complete a simple registration form, and they become eligible to win any one of 27 exciting prizes! This campaign was built on Votigo’s Enterprise Platform and features social sharing, email database opt-in functionality and mobile responsive design. Ready to talk about your upcoming sweepstakes, or learn about any of Votigo’s other promotion types? Click here to schedule a live demo with an Account Representative.